Infinix Mobility recently added to their Hot series, releasing another great smartphone tagged Hot 6 Pro, a smartphone featuring 6.0 inch 18:9 Infinity Screen display, outstanding Dual Rear Cameras 2GB/3GB + 16GB/32GB RAM & ROM, 4000 mAh battery and lots more. Infinix Hot 6 Pro comes in two version the one with 2GB RAM + 16GB internal storage memory and the one with 3GB RAM + 32GB Internal storage memory and you are to choose the version that suit you most but their price will equally be different but we are yet to know that so keep reading till the end to find out more about their specifications & prices. Let's take a look at the key features and functionalities of this smartphone to know its worth and at the same time find out if Hot 6 Pro is really what you need or not. Infinix Hot 6 Pro is a well-designed smartphone with big 6.0 inch IPS HD Display and 1440x720 resolution & 160.43 mm x 76.21 mm x 8.6 mm dimension which makes it a perfect choice for those who likes it big and smart, with Hot 6 pro you are assured of the best visual experience and unlimited fun. As a new smartphone, everything remains up to date as it comes with the latest Android 8.0 operating system clocked with Quad-core 1.4 GHz processor & Qualcomm Snapdragon chipset designed to give you the best speed, stability, and overall excellent performance while allowing you to explore and enjoy all the goodies that Android OS offers. To make sure that Hot 6 Pro is not too expensive to an average Nigerian they decided to provide 2 different versions, 2GB + 16GB RAM & ROM and 3GB + 32GB RAM & ROM so you are the one to choose among the two versions but whichever one you choose remains your choice, there are both good. Hot 6 Pro is equipped with 5MP front selfie camera and 13MP + 2MP dual rear cameras with front camera image size up to 2560x1920 while dual rear camera size is up to 4160x3120 giving you all you need to capture great moments in a stylish way. Infinix never jokes with power as they fully understand the needs of Nigerians that is why they allow providing strong and long-lasting battery capacity in almost all their smartphones and Infinix Hot 6 Pro will not be an exception to that it is powered by a 4000 mAh battery designed to keep you connected all day long. Hot 6 is designed for the best internet speed and experience as it comes with fourth generation network (4G) that gives you the best speed when it comes to web browsing, online streaming, downloading and uploading. On the other hand, Hot 6 pro comes with all the basic sensors which include G-sensor, Light Sensor, eCompass, Proximity Sensor, Gyroscope, Fingerprint. 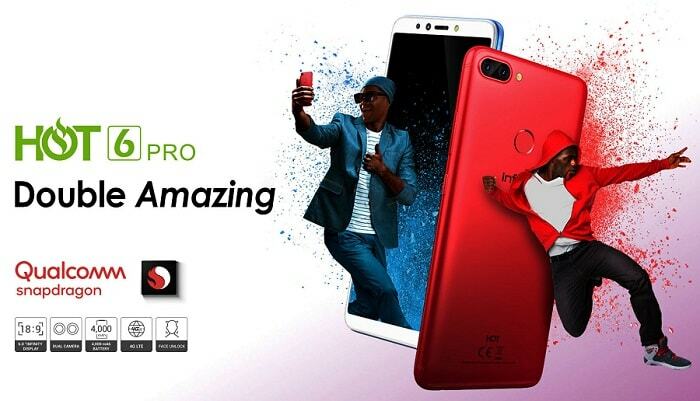 If you have been waiting to see the price of Infinix Hot 6 Pro 2GB RAM + 16GB ROM and 3GB RAM + 32GB ROM then wait no more but remember the price below at the time of the publication is correct but are subject to change anytime. Still, need to know more then check out the full specifications below.